Call during business hours to make your appointment, or book online 24/7 and one of our friendly staff will get back to you the next business day. Click here to book an appointment 24/7 through our online website booking form. Our iPhone app is being redeveloped, and a new version will available later this year. All online bookings can be made via our Booking Form. Our original studio is located at 491 Portrush Road Glenunga, near the Burnside Village Shopping Centre. Glenunga is open Monday to Saturday from 8am by appointment. SUMMER HOURS: Glenunga currently closes at 4.45pm Monday to Friday – check what time you can collect your dog when you book your appointment. 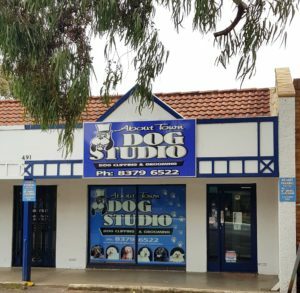 Our southern studio is located in the Adelaide Hills, at 170 Main Road, Blackwood, opposite Rubens Pet Food and Accessories, in the “Blackwood Plaza” set of shops. Blackwood is open Tuesday to Saturday from 8am by appointment. Featured in the 2019 Blackwood District Business & Trade Directory, view the online listing here. The Rostrevor salon is now under new ownership. Read more here: Latest News. Contact the new owner if you need a dog groomer in the north eastern suburbs www.pawsthenplay.com.au. 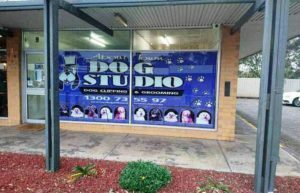 About Town Dog Studio is conveniently located at 2 locations in the eastern suburbs of Adelaide to cater to our valued customers. Our studios are air-conditioned and comfortable for your best friend. They can listen to music as they relax in the caring hands of our staff. Many of them sleep after their treatment, others socialise with their new friends. There is plenty of fresh water available and treats as they leave. Please note that grooming salons are not licensed to give sedatives and we do NOT have sedatives on the premises! We look after your dog’s grooming requirements, and we leave any medications required to be handled by your vet.